MOSCOW, March 11. /TASS/. A MiG-31 interceptor jet made a training launch of a Kinzhal aeroballistic hypersonic missile and the missile hit a target on the test range, the Russian Defense Ministry said on Sunday. "A MiG-31 fighter crew of the Russian Aerospace Forces made a training launch of a hypersonic missile of the Kinzhal high-precision air missile system in the predetermined area," the ministry said. The MiG-31 departed from an airfield in the Southern Military District within the framework of a testing air alert. "The launch was normal; the hypersonic missile hit the preset target on the test site," the ministry added. "Performance characteristics and time indicators of the Kinzhal high-precision airborne missile system were confirmed during the hypersonic missile launch," the ministry said. Crews of the Kinzhal air system comprising a MiG-31 interceptor jet and an advanced hypersonic missile made 250 flights from the beginning of 2018, the Russian Defense Ministry said on Sunday. "Crews of the air system on the testing air alert sorties completed over 250 flights year-to-date under the combat training plan. The air staff has been trained in full scope day and night in various weather conditions," the ministry said. 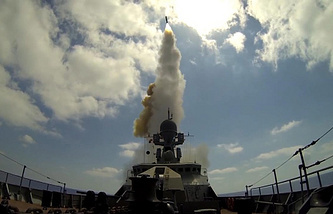 The Kinzhal system is intended for destruction of surface and waterborne targets. The Kinzhal system was developed based on the MiG-31 upgraded interceptor jet. It is equipped with high-precision aeroballistic missiles supporting strikes at a range over 2,000 km without entering the enemy’s air defense zone. The system has no counterparts across the globe owing to high flight performance characteristic of the MiG-31 fighter jet and the hypersonic missile with a small radar signature and high maneuverability.